Some of the great features of this home espresso machine include its articulating steam wand, ability to produce a great number of different espresso beverages just like those you can get at your local coffee shops, and a relatively short complete brew time of about 3.5 minutes. Industrial-quality head for exceptional water heat stability and premium extraction quality. Ergonomic 58-mm porta-filters, which also provides the home barista with outstanding extraction of coffee from grounds. The porta-filters that come with this machine are the same ones used with Rancilio industrial espresso makers. The prominent and traditional design of this semi-auto espresso maker has been constructed to last. Its solid linear design has been constructed of an iron framework, as well as stainless-steel side panels, in keeping with the commercial quality that the Rancilio Team always provides for outstanding heat stability, as well as premium extraction of high-quality espresso beverages. Read this Rancilio HSD-Silvia V3 Silvia espresso machine review if you have been considering a machine that is very sturdily constructed of iron framework and stainless steel side panels, designed to last for many years. The trademarked 58mm portafilter provides for outstanding tamping of grounds and extraction of flavor, and this type of portafilter is the same that is utilized on the Rancilio industrial espresso machines used by professional baristas. Although the Silvia has just a single boiler, this boiler holds the largest volume of water than any other in its classification of machine, by holding at one time a whopping 0.3 liters (12 ounces) of water. In addition, the other exceptional quality of this boiler is that it is brass with a chrome-plated exterior, which generates superior steam power and exceptional recovery time in between espresso shots. In addition, the 2-quart water storage tank can be refilled either by removing it and refilling it at the sink, or filled up while still affixed to the machine via the top of the machine at any point throughout the espresso-brewing process. Additionally, the Rancilio Silvia showcases an articulating stainless-steel steam wand allowing for total range of movement for frothing milk with the best result imaginable. Steaming power is controlled with the steam knob which has been designed with the commercial industry in mind. Also arrives with a 7-gram scoop for measuring coffee, a plastic tamper, and filter baskets for both singles and doubles. Below are additional details regarding this semi-automatic machine that we consider to be a super choice! Single brass boiler with the largest volume capacity of any home espresso maker in its class, which holds 12 ounces of water at a time, provides superior steaming power and very fast recovery time between shots. A 2-quart water tank that can either be removed for refills, or filled from the top, even during the brewing process. An articulating stainless-steel steam wand, which allows for great range of movement and provides excellent steaming of milk, with the steam power controlled with a commercially-designed steam knob. Also included are a 7-gram coffee scoop, plastic tamper, and two filter baskets for either single or double shots. This machine is in the semi-automatic class of home espresso machines. If it is a super-automatic home espresso machine you are leaning more toward buying, the Philips Saeco Intelia is a very highly customer-rated one to consider. No, this machine is not programmable. Most semi-automatic espresso makers are not programmable. Some people report this machine is not very easy to use, while others state this machine is very easy to use, as long as you have a good coffee bean grinder. Some practice is apparently needed to get the right grind with this espresso machine, in order to draw good shots. Other than that, it is easy to use. This machine can virtually make any espresso beverage you can find at your local coffee house or Starbucks. What is the cup height allowance of this machine? This espresso maker allows for using a cup up to 3 inches tall. If it is more cup clearance you are looking for a machine that allows for more cup clearance, you might want to check out the Mr. Coffee Cafe Baristamachine. Although this machine, purchased as is, uses coffee grounds only, there is an optional pod and capsule adaptor kit available that can be bought separately. No – There is no built-in coffee grinder with this machine. You would need to either have pre-ground coffee on hand or purchase a separate grinder to grind your own whole coffee beans. If it is a home espresso machine with a built-in grinder you want, the Krups Espresseria Bean To Cup machine is a top-rated one that offers this option. This is not applicable, as this machine does not have a built-in grinder; thus there is no need for a bean hopper. Although this one has no actual LCD display, it does showcase a very impressive front panel. The stainless steel steam wand that this machine has is commercial grade and is great for producing rich, creamy froth as well as steamed water for beverages such as hot cocoa. Warm-up/brew time takes about 3-1/2 minutes. The double spouts on this machine allow for brewing either two single shots at a time, or one double shot. Yes, this one does have a cup warmer. The Rancilio Silvia is available in stainless steel (silver) only. If you are unsure which color you want, the Nespresso Inissia comes in a multitude of colors including red, blue, black, orange, and white. This machine his housed in stainless steel. It also has a very sturdy framework made of iron, guaranteed to last many years. This machine has a single boiler made of brass. No, it instead has a single boiler made of brass. This is about the only machine reviewed thus far where a customer actually made note of how quiet this machine is while running. This machine features a very heavy-duty 15 bar pump. This machine has a very large 67-ounce water reservoir. Steaming/Hot Water: Featuring a commercial grade chrome-plated steam wand, the Rancilio Silvia quickly delivers plenty of steam for milk frothing and hot boiling water for your Americano or a cup of tea. This machine is rated as being easy to clean up after using, although the drip tray apparently needs to be emptied quite frequently due to its small size. This machine is approximately 9-1/2 inches wide x 11 inches deep x 13-1/2 inches tall. Although this machine has a one-year warranty, customers have reported they had no need to even think about using the warranty, based on the long life of this very sturdy and durable machine. This machine is powered off of 1,100 watts. Ease of use – most customers who purchased this machine noted how easy it was to use. Commercial-grade steam wand is one of the best available among the range of home espresso machines. High quality and durable construction, both inside and out, ensures many years of use. Great price when you consider the many years of use you likely will get out of this machine. 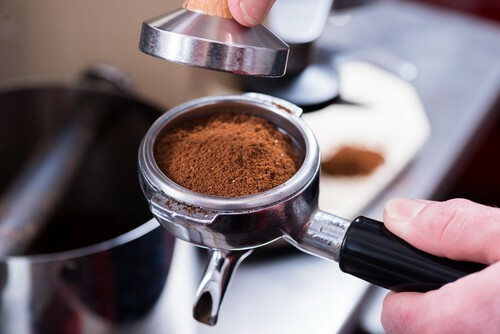 Grind of coffee needs to be exact in order to extract great espresso – this will take some practice, trial, and error in most cases, unless you are a professional barista. There are no programmable options available with this machine.